1. Take your 4 large chicken breasts and slice into strips creating mini fillets, I usually get about 8 strips out of each breast using Muscle Food chicken breasts, however if you're using supermarket chicken breast you may find it more beneficial to buy mini fillets already cut to size, to ensure you get the most out of the breast. 2. Evenly sprinkle a generous amount of smash granules onto a large plate, and pour your 2 beaten eggs into a wide bowl, preheat the oven to 190 degrees. 3. Take a strip of chicken dip in the beaten egg & roll onto the smash, make sure the chicken strip is evenly coated by the smash. Once battered add to a baking tray lined with greaseproof paper, repeat this step until all chicken is generously & evenly battered. 4. Cook your chicken until it appears to being going golden brown on the edges, this will take around 25 - 30 minutes. 5. Whilst your chicken is cooking, thinly slice one whole large onion and if not already done so, slice your peppers thinly too. I use ready sliced frozen mixed peppers, which is way cheaper & cuts out some of the preparatory time. 6. 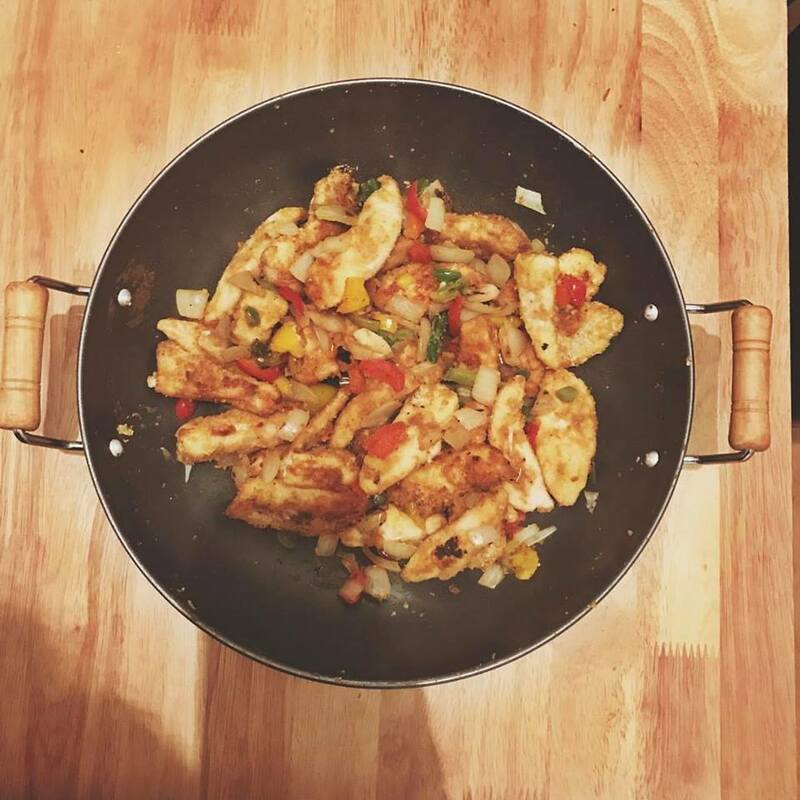 Cook the onions & peppers together in a wok in low calorie cooking spray on a low heated hob during the last 10 minute of the cooking time for the chicken, stirring regularly. 7. Once you are satisfied that your chicken is cooked through and appearing golden around the edges, remove from the oven and move chicken from the baking tray to the wok with onions and peppers slowly cooking. 8. To the wok add 2 pinches of salt, 1 tbsp garlic granules/2 cloves of garlic and dark soy sauce. Stir all the ingredients together until the chicken is evenly coated in soy sauce. 9. Stir and mix together the chicken, onions and pepper evenly until the onions and pepper are soft, serve with syn free egg fried rice (recipe here) or sweet potato wedges. I hope you enjoy this recipe as much as I do, it is by far the best Slimming World meal in my opinion. If you would like anymore information or would like to see a particular recipe made Slimming World friendly, then just find me on social media or comment below and I will be happy to answer any questions or requests you may have. Enjoy!